Ironman Wisconsin is the most complex race I have ever volunteered at or participated in. More than 4000 volunteers are needed to help the 2500+ racers compete in this race. Volunteer coordinators, volunteer captains, veteran volunteers, and first-timers are all needed. If you want one of the coveted spots as finish line catcher or wetsuit stripper make sure you sign up early because those spots go fast! Volunteer registration opens April 1. Early Saturday, September 7, I headed up to Madison to attend the volunteer meeting. 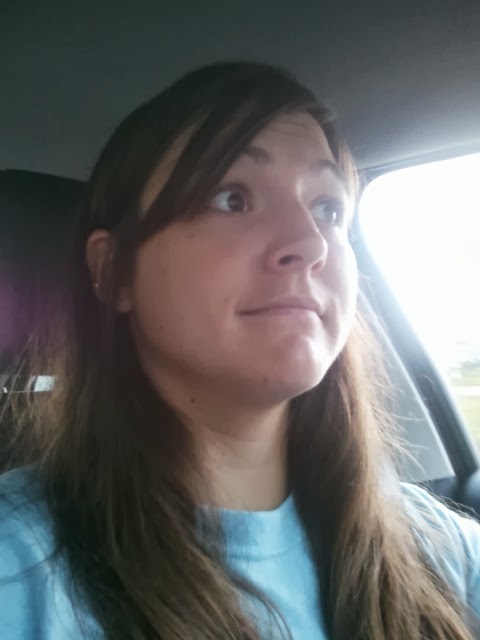 The meeting started at 8 am so I had to leave my apartment around 5:30 to make it on time. After a busy week at work and not feeling super well, I was really dragging, but I managed to make it up there just fine. The volunteer meeting is "mandatory" for volunteers except those volunteering at aid stations. The swim volunteers also have a separate meeting. Although we were supposed to attend the volunteer meeting, from what I understood it wasn't a big deal if you couldn't attend. Those in my particular volunteer group were asked to show up a little earlier on race morning for the short training lesson. At the volunteer meeting, they handed out our t-shirts, wristbands, and parking passes for the next day. Our volunteer t-shirt was our pass to get in line for 2014 registration. I was volunteering at the women's change tent in the morning so the swim-to-bike transition. The captain went over what would happen on race day, how we should handle the athletes, what issues we might run into, etc. She did a really great job of describing what the experience would be like when she described it as "organized chaos". After the volunteer meeting, I took some time to browse around the Dane County Farmer's Market around the Capitol Building. I bought breakfast and a few treats for Matt and myself. Then I headed off to Panera to work on my computer for a few hours while Matt was making the drive. We hadn't seen each other in a few weeks by this point, so he decided to make the drive up and hang out with me. I'm not going to recap our whole day because that is not the point of this post, but I love Madison and I could totally see myself living there one day. Race morning, I needed to be at Monona Terrace around 7 am. I opted to use the remote parking at the Alliant Energy Center for $6.50 and take the shuttle bus to the race area. I was worried that the volunteer parking in the ramps near the start would be full and I didn't want to risk being late. I probably didn't need to worry because when I walked by there were still plenty of spots. Our group of volunteers had time to watch the swim for a while as the first athletes wouldn't be coming through transition till about 8 am. The setup looked like this--one big room split in half with the front half containing all the T1 bags, the back part of the room was again split with one half for men and one half for women. An athlete would come running through the door and down their respective aisle to collect their gear bag then they would run into either the men's or women's changing area. 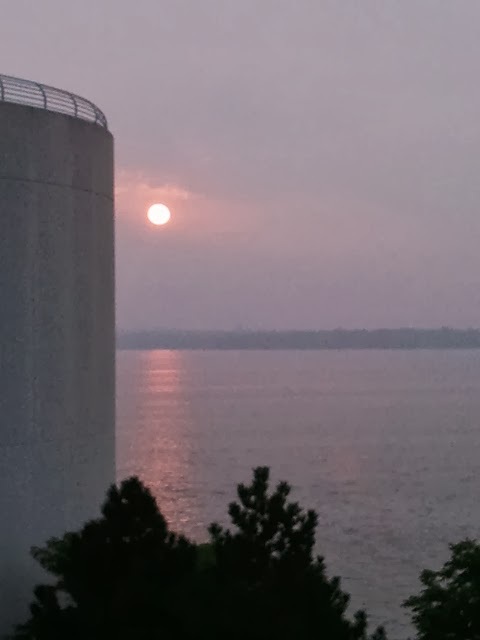 The swim was a little slow this year due to some choppy water on Lake Monona. At first, the pro athletes just slowly trickled in and I looked on as the veteran volunteers helped them out. Then the age-group triathletes started coming in. At this point, the job seemed easy. 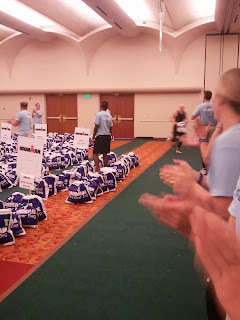 The volunteers lined up outside our curtained off area and as an female athlete came towards us we would help them with their bag and take them inside to the chairs. Once inside, we would help the athlete with whatever they needed. Usually that involved dumping out their transition bag and organizing the stuff inside. Some athletes opted to change completely so that usually involved trying to pull a sports bra on over their wet skin. Yeah, not easy. Then we would gather up the athlete's stuff and put it all back in the bag this stuff included their wetsuit, goggles, and then any other things they had in their bag they didn't take with them. Once the bag was closed we dropped it off in it's number range by the wall and headed back outside to help the next athlete. Apparently this was just the calm before the storm because all of a sudden it was like a bomb went off and there were athletes everywhere. At one point, I was helping three athletes at once and I didn't even have time to put their bags back where they were supposed to go. I was just concentrating on getting all their belongings back into their bag. It was very interesting to see all the different methods for packing transition bags. Some people were over-packers and one lady forgot her towel. Some athletes changed clothes completely some just grabbed their bike belonging and headed out. Some were super quick and others I had a chance to chat with while they took their sweet old time. Then just like that it was over and the athletes stopped coming in. A few missed the swim cutoff and that was heartbreaking for me. To know how much time they've spent training over the last few MONTHS and then get cut off before making it to the bike was hard. After that we helped organize all the transition bags and the morning bags so athletes would be able to pick them up later in the day. I spent the rest of the day cheering out at Verona on the bike course and then by the capital building on the run course. We got to watch the overall winner Maik cross the finish line! Awesome! It was so inspiring to watch the athletes. Putting on a sports bra when you are dripping wet just isn't easy. It's gets all twisted up and stuck. I'm considering not changing at all in this transition 1. Write your name/race number on everything. It gets chaotic and if you lose something, it will be much easier to find this way. If you are going to wear arm warmers roll them up so they are easier to put on. Again with the wet skin thing. I did have a couple of funny experiences including someone forgetting a towel. Several athletes asked me if they should wear their arm warmers?! (I told them I wouldn't.) Another asked me if she should wear socks under her bike shoes. I asked if she normally wore them (she didn't) and if she had socks in her run bag (she did) so she went off without them. It made me wonder if they hadn't thought about that at all before they were standing in transition! So many athletes thanked me and it was a lot of fun to be out their volunteering. It gives me more perspective on this Ironman racing thing. I wanted to stay at the finish line till midnight to watch the final finishers coming in but I had to go back to the hotel room to get caught up on some work for Monday. 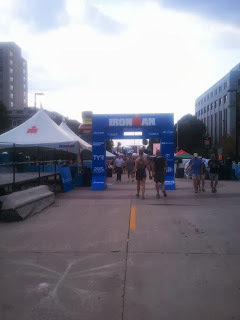 Monday I was up again bright and early to stand in line for, you guessed it--Ironman Wisconsin 2014 registration. Volunteers get priority on-site registration for the next year, followed by on-site registration for the general public. On-line registration opens later. On-site isn't registration isn't officially scheduled to open until 9 am but several other volunteers told me I needed to get their early. When I arrived a little after 6 am, there were already over 100 people lined up. The wait wasn't too bad and I spent the time chatting to others in line near me. While we were standing or sitting in line, Ironman people came around with little cards and we were asked to write down our name, address and email address. The doors probably opened early around 7:30 am. The line moved very quickly and I was in my car and on my way to work by 8 am! oh sh*t, what did I just do? I didn't actually "sign up" that day more like I paid a whole bunch of money to reserve my spot. A few weeks later, I got an email with the link to the actual sign up. 2014 is going to be a big year!